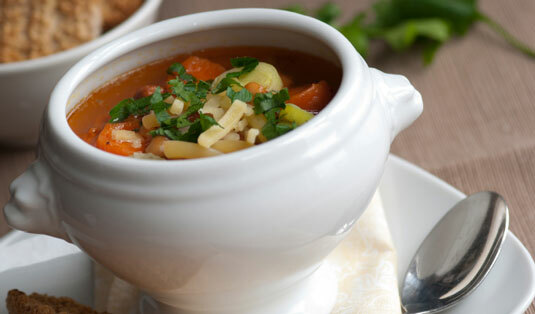 The Italian name for this Tuscan soup literally translates as “reboiled” or “recooked.” Traditionally, this soup is made from leftover vegetable soup. To stretch the leftovers, bread is added. The result is a thick, stewlike vegetable soup. Tuscans have become so enamored of this soup that they often make it from scratch. Until this century, most Italians didn’t have an oven at home. If they needed to bake something, they took a pot down to the local bakery and used the ovens after the bread for the day was made. You may simmer it on top of the stove if you prefer. In a large, oven-safe soup pot or saucepan, combine the pancetta, onion, leek, carrot, celery, and 1⁄4 cup olive oil. Cook over medium-high heat, stirring occasionally, until the vegetables just begin to brown, about 5 minutes. Add the cabbage, kale, Swiss chard, zucchini, tomatoes, potatoes, and cooked cannellini beans. Cook, stirring often, for 5 minutes, and then add water or vegetable stock and the bread. Season with salt and pepper. Stir well, add the wine, cover, and cook for 5 minutes. Transfer the pot to the oven. Bake for 1 hour, stirring occasionally, until the beans and vegetables are soft. Spoon into hot soup bowls and sprinkle with the remaining 2 tablespoons olive oil and the scallions.